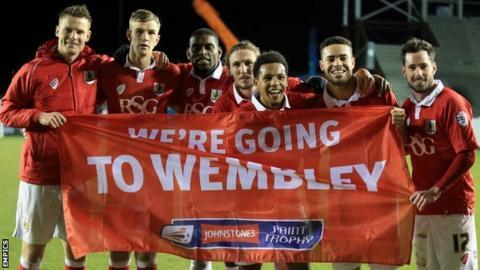 Matt Smith says he will be "honoured" to travel with the Bristol City squad for the Johnstone's Paint Trophy final, despite being ineligible. His emergency loan from Fulham cannot be extended beyond 93 days and will end before the Wembley trip on 22 March. But Smith has been asked to be involved off the pitch after scoring all City's goals in their 5-3 southern area final aggregate win over Gillingham. "It's a touch of class from the manager," said the 25-year-old. He told BBC Radio Bristol: "I'll be honoured to be there. I'm a bit gutted to miss out, but I knew I wouldn't be able to play at Wembley if we were to get there. "I just hope that further along in my career, I'll get there. In this case, I'll be the 12th man in the stands." Smith scored four goals in the 4-2 first leg victory against Gillingham and another on Thursday's 1-1 draw, making him the top scorer in the competition. During his two months at City, the former Oldham forward has scored 10 times in 13 matches, helping Steve Cotterill's side stay in the automatic promotion places in League One. Fulham paid Leeds £500,000 when they signed Smith last summer on a three-year deal, but he has found options limited at the Championship club - a situation not helped by being sent off on his debut. Smith admitted: "My career there has been a non-event, really. It's obviously disappointing. I felt it was a great opportunity and a step in the right direction having had a good season at Leeds. "But things happen. The debut didn't help, nor did the managerial change for me personally, but it's one of those things. "One door closes and another one opens. I'm not saying the door is closed at Fulham - far from it - but it's an opportunity here to do well and get back on track. "I'll go back there and do everything I can to get back in the team."